FREE UK DELIVERY + £10 OFF YOUR 1ST ORDER. Enter discount code 'NCD10' at checkout. 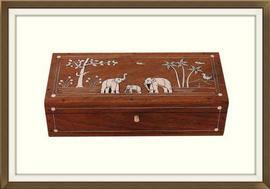 This is a beautiful vintage inlaid jewellery box, made of Rosewood and of Indian origin. It dates to the 1950s and is in lovely condition. The interior has been newly refurbished. 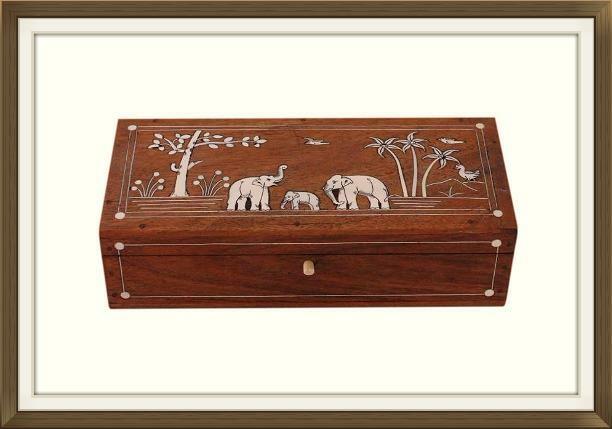 This box is made of solid Rosewood and has beautiful inlaid bone decoration. 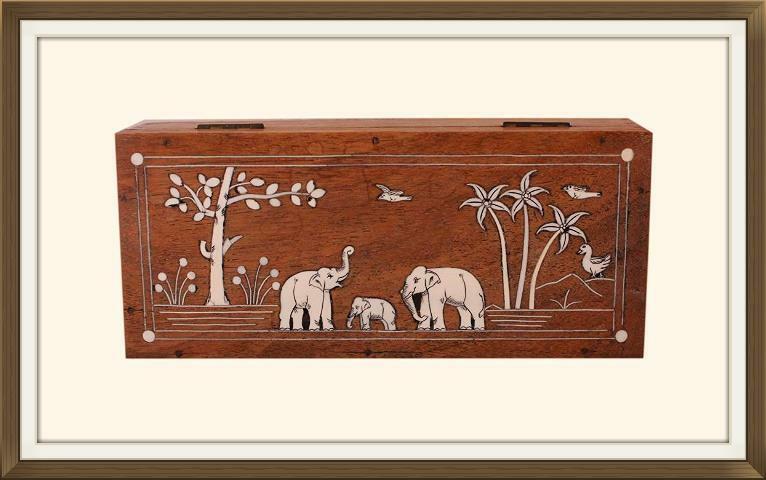 There are beautiful inlaid elephants, birds, trees and flowers, as well as inlaid roundels and stringing. 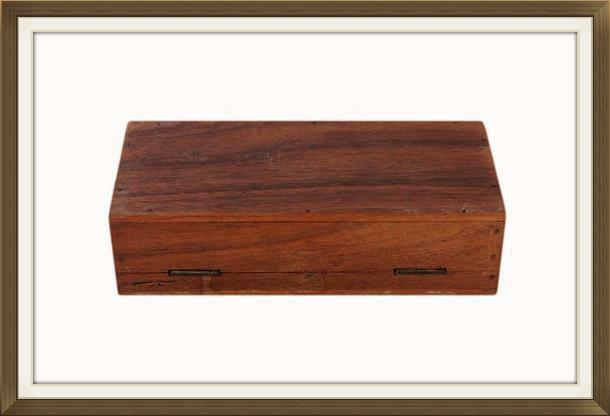 The box has its original brass hinges and brass catch. This is a quality sprung catch with a bone knob to match the inlay. 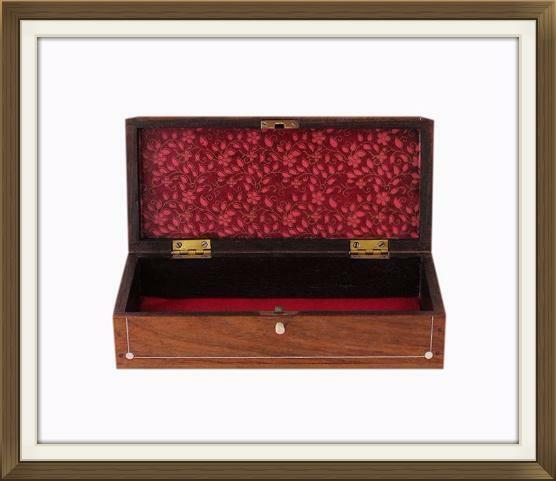 The interior has been beautifully refurbished by our skilled box restorer. It has a single compartment with a new padded satin panel. The inside of the lid has a new floral paper lining. This is a quality hand printed paper with beautiful flowers, leaves, and gold highlights. The satin is a beautiful raspberry red shade. This box is in wonderful condition. It is structurally sound and has very little wear. The hinges are still in perfect working order and the catch is still very secure. All of the inlay is present and intact. There are a few faint water marks on the lid which are not very noticeable. 18.8 by 7.5cm with a 3.2cm depth. This box will be posted FREE within the UK by Royal Mail Next Day Special Delivery. International postage is £25. Delivery is fast, within 3-5 working days to Europe and 5-7 working days to the rest of the world. Delivery is by Royal Mail International Tracked and Signed. If you are also looking for Vintage or Antique Jewellery then please visit our sister site below.